When I think about gaming keyboards, I’d be lying if I said Logitech was one of the first names to come to mind. Sure, they’ve been in the game for decades, but the keyboard space isn’t where I think of them hanging out, so when I got the chance to check out the recent G512 Carbon RGB keyboard, I went in with an open mind, as I was really tired of the look and feel that companies like Razer have imbued the world of gaming peripherals with. As far as construction and design go, the G512 Carbon is a fairly simple, yet sturdy beast. It features a standard QWERTY keyboard layout housed in a simple plastic frame topped with a darker brushed aluminum faceplate. It’s a welcome look from competitors like Razer and the like who’s products have that loud and somewhat gaudy look commonly associated with gaming peripherals. As such, the G512 Carbon feels just at home on my desk at the office as it does at my gaming setup, which is a welcome change if you ask me. That all said, it is still a gaming keyboard, though, and as such it’s completely kitted out with a set of RGB under lights, which I know a lot of people can take or leave. There’s a selection of five or so onboard presets that you can cycle through to find a lighting scheme that fits your liking, and if none suffice you can customize every aspect of the lighting through the company’s proprietary Logitech Lighting Software, which anyone who has used something like Razer Chroma can navigate and edit with ease. It’s also worth noting that as with any keyboard worth it’s salt these days, the G512 Carbon supports game specific profiles with over 500 games currently supported and more said to be on the way. 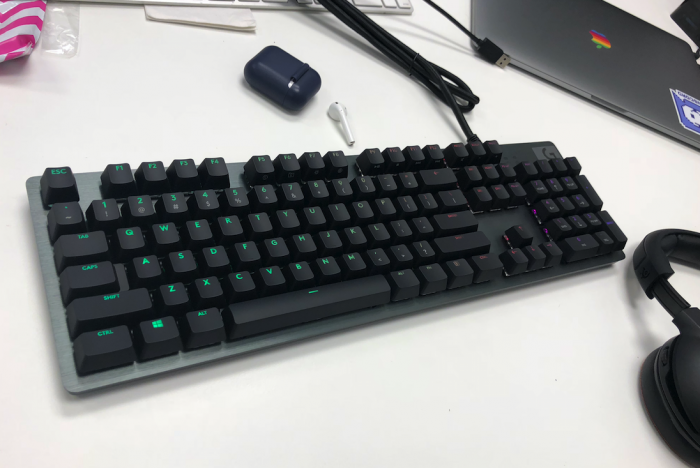 We received and tested the version of the keyboard with GX Blue mechanical switches, but there are also Roamer-G variants out there if you would prefer that. The GX Blue switches feel good, there’s a nice, clicky response. For those unfamiliar with mechanical keys, a blue switch generally has a heavier feel and louder click than lets say, a Cherry brown or black switch, but also provides some of the best tactile feedback out there. Unlike the Romer-G switches used in the variant, the GX Blue switches contain a traditional mechanical key switch, and you really feel it. The keys feel nice and responsive, and the loud tactile click was satisfying in both gaming or just day-to-day typing and computing. That said, the noise level may be off-putting for some who work in a place where key noise would be an issue or if they live in a small apartment where you could really piss someone off, but in my testing I found it to be manageable enough and got very few complaints. It’s definitely noticeable coming from a membrane or chuckled keyboard, however. It’s interesting to see Logitech diversify their key switch offering, and I look forward to them hopefully adding more options like browns in the future to better suit the needs of their consumer base, but it’s definitely a step in the right direction. Feature-wise the G12 Carbon is pretty standard. Function keys double as media and light controls, and you can tweak functions in the Logitech app or at a system level. The unit also has a built-in USB port, which I’m usually all for, however, the port on the G512 Carbon is USB 2.0 which seems like a bit of an oversight, considering it’s a gaming keyboard releasing in 2018. I’m not quite sure what exactly I would use it for, as it’s too slow to move large files and if I’m sitting at my desk any gaming peripherals would be plugged directly into my PC. That said, I would still rather have a slow port than no port at all, so it’s still a minor ding on an otherwise satisfactory keyboard. While it’s not radically different from other offerings on the market as far as features or tactile response goes, if you’re looking for something that is less in your face and doesn’t scream “GAMER” while still getting a similar level of tactile performance, I can wholeheartedly recommend the Logitech G512 Carbon. The review is based on a retail unit sent to to the reviewer by Logitech.